A large amount of itemized deductions on your taxes may trigger the AMT. 2. Can Taking the Standard Deduction Help to Avoid the Alternative Minimum Tax? In 1969, Congress established the Alternative Minimum Tax, or AMT, as a means of ensuring that the wealthiest taxpayers don't use excess deductions and exemptions to get out of paying any taxes at all. Since that time, the AMT has changed from a tax on the wealthy to one that increases the tax burden for the middle class. What once affected only those earning $200,000 per year or more now affects those with much lower income levels. To determine if you have to pay this tax, consider not only your income but the type and amount of your tax deductions. The only way to know for sure whether you have to pay the AMT is to complete the 1040 tax form. Line 45 will prompt you to fill out the AMT worksheet Form 6251 if your income is higher than a certain level. If the tax you owe based on the 6251 is higher than the tax you owe based on your 1040, then you must pay the higher of the two taxes, also known as the AMT. While the Internal Revenue Service requires all taxpayers to fill out the 1040 to determine whether they are subject to the AMT, you can get a quick idea of whether you are subject to this tax based on your taxable income. Under the AMT, taxable income is calculated differently than it is on the standard 1040 tax form. On the 1040, taxpayers start with their gross income, then take deductions and exemptions to arrive at their taxable income. Under the AMT, you start with your gross income, but you don't get nearly as many deductions, exemptions or credits. In fact, the AMT does not allow you to subtract many expenses, business credits and exemptions, child credits or even personal exemptions. That means that the taxable income under the AMT is much closer in value to gross income than it is under standard tax calculations. The IRS allows for certain exemptions under the AMT system. If your taxable income per the AMT worksheet is higher than these exemption levels, you must pay the AMT. In 2011, the exemption for married couples filing jointly was $74,450, while the exemption for single or head of household filers was $48,450. For married individuals filing separately, the exemption is just $37,225. Certain factors can serve as warning signs that you may have to pay the alternative minimum tax. 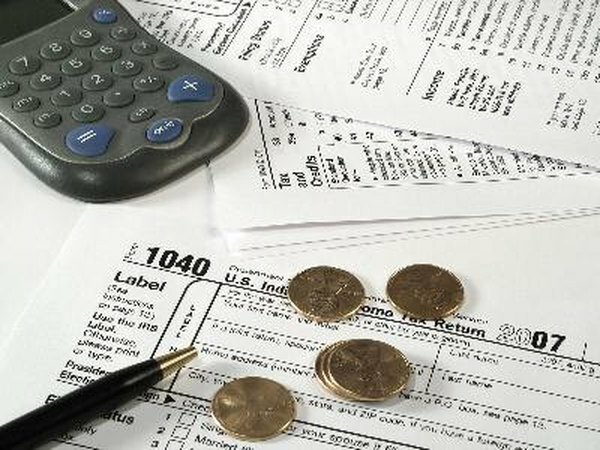 According to CNN, if your adjusted gross income is significantly different from your actual income, you may be subject to this tax. If you have a large number of itemized deductions, live in a place with high local and state taxes, or have a high mortgage interest deduction, you may also find that you have to pay this tax. One of the best ways to avoid having to pay the AMT is to minimize the deductions you claim on your 1040. Rather than listing unreimbursed business expenses on your tax return, try to get your employer to reimburse you directly. Instead of prepaying property taxes or other local taxes, wait until these fees are due in order to minimize your property tax deductions. Take advantage of pretax medical savings plans instead of itemizing your medical expenses. Work with your accountant to defer or adjust deductions and when you claim them to minimize your tax burden. In 1969 when the AMT was established, the income exemption for married couples was set at $40,000. That meant that the AMT was limited to only the wealthiest taxpayers. Unfortunately, the AMT is not adjusted for inflation, so technically the exemption level still sits at $40,000. Most years, Congress votes to set a "patch" in place to raise these exemption levels to ensure the AMT affects only wealthier taxpayers. Without this patch, a large number of middle class taxpayers could find themselves paying the AMT. How Much Do You Need in Deductions to File Itemized?